Dr. Spiegel is as a dedicated, compassionate surgeon. She focuses on providing her patients with the best possible aesthetic outcome, while responding to their emotional needs. Recognizing each patient is unique, she tailors their treatment, taking into consideration their medical needs and the results they want to achieve. Dr. Spiegel provides her patients with the education and tools needed to be proactive about their care; she offers hope and inspiration, improving their outlook and their aesthetic outcome builds self-esteem and confidence ultimately improving overall quality of life and well-being. She skillfully guides her patient as surgeon and advocate through treatment and recovery. Never forgetting the importance of their journey, Dr. Spiegel created the Pink Sisters Support Group for breast cancer patients to connect. Dr. Spiegel is certified by the American Board of Plastic Surgeons and is the Director of the Center for Breast Restoration at the Institute for Reconstructive Surgery. Her expertise in microvascular breast reconstruction and restoration offers patients more choices and better outcomes than ever before. 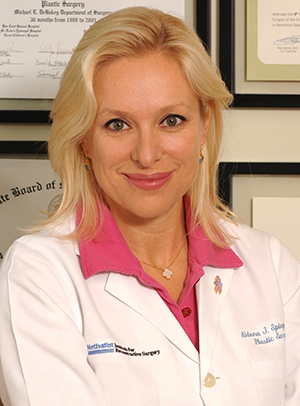 Dr. Spiegel’s main surgical focus is breast reconstruction for cancer patients. She utilizes the most sophisticated innovative techniques and approaches in composite breast restoration, sensory nerve regeneration, and fat-grafting. Additionally, Dr. Spiegel performs aesthetic surgery for post-operative corrective breast surgery, congenital breast defect correction, breast lift, symmetry, reduction, and augmentation.